Built-in dishwasher removal. Where do you start? What’s the procedure for getting this thing that’s under the kitchen counter out? There certainly is no question this is a daunting task. After all, it involves plumbing and electrical wiring. But, it’s really not that difficult. You just have to get past the fact it’s “built-in” because that’s a complete misnomer. It just takes a few straightforward steps to get it done. Of course, you don’t want to jump the gun. There must be a legitimate reason for a built-in dishwasher removal. Otherwise, you can skip the whole thing and just have it repaired. The question now becomes, is it really time for it to go? Well, you should look for some common failing dishwasher signs. For instance, if it goes through a whole cycle but doesn’t clean. Or, water pools around the bottom of the appliance. 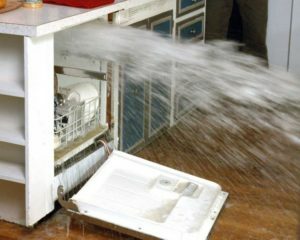 Those two symptoms are bad news and likely mean you’ll need a replacement built-in dishwasher. Or, if the thing overfills and under-fills with water during operation. Strange sounds are also an indication that it’s dying out. The truth is, in most cases, it’s usually less expensive to replace it than fix it. And, if you do, you’ll get a new appliance, which is a big plus because it will use less water and energy. Empty the dishwasher. First, if there are any dishes inside the unit, take them out and put them to the side. You don’t need the headache of dealing with broken glasses and dishes on top of what you’re already doing. Turn off the water supply. Next, you’ll turn off the water supply to the appliance (if applicable). Then, unplug it or turn off the breaker which supplies power. And surround it with towels on the floor to catch any water that leaks out as you pull it out from under the counter. Unfasten the retaining screws. Now, unfasten the retaining screws located under the lip of the countertop and place them to the side. The appliance can then be pulled out of place. Unhook the water lines and pull it out. If you need appliance removal for any property, go ahead and phone 800-433-1094 or visit Junk Garbage Removal.